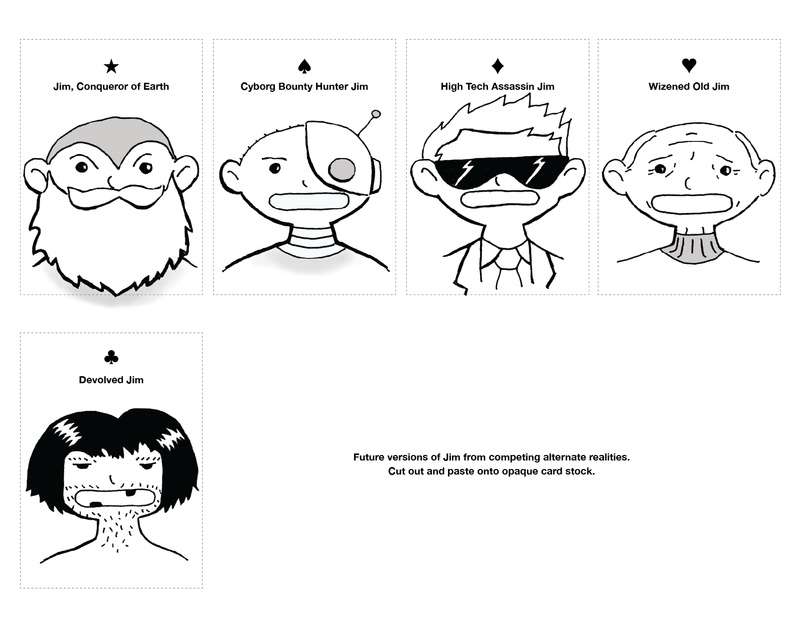 Lives of Jim is a strategy game, for two to four people, in which players take on the role of a "version" of the hapless Jim. Each version of Jim is from an alternate, future reality. Players compete to become rulers of all Jim-realities, thereby ensuring their survival. To do this players will generate time particles, collect node connector and reality rotation cards, and move their player tokens deeper into the Jim-time-pool to become the one, true Jim. Shuffle the character cards together and deal out 1 to each player, or 2 each in a two player game. Remove the leftover character cards, face down, from the game, and keep them secret until the end. No peeking. Shuffle the connector and rotation cards together and deal out 3 to each player. Deal out 5 each in a two player game. Take the rest of the shuffled connector and rotation cards and place them on the leftmost space of the asset board. Deal out three cards face up from the draw pile in the three spaces next to it to form a stock. Give each player 5 time particles and place the remaining time particle chips near the board to form a stock of time particles. Give each player 6 player tokens or 9 player tokens in a two player game. Be the first player to control your home reality: have your player tokens in the three circles of the two innermost rings on the big board that match your character card. In a two player game be the first player to control your two home realities: have your player tokens in the six circles of the two innermost rings on the big board that match your two character cards. On your turn you may perform two actions (two actions!) from the following list of actions. You may perform two different actions if you’re able or the same two actions if you’re able. If you choose to connect — and you have the cards and time particles to do it! 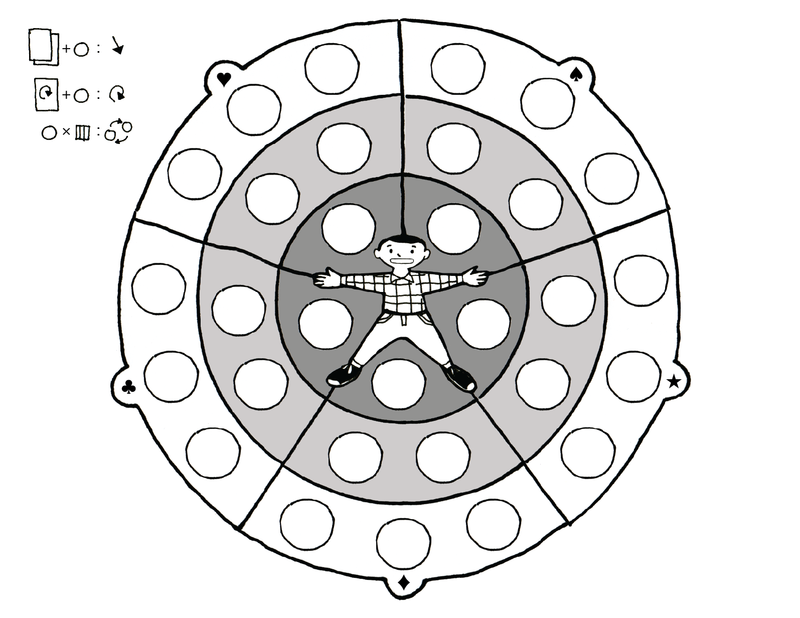 — you may place one of your player tokens on a space of the outermost ring of the big board and only the outermost ring. 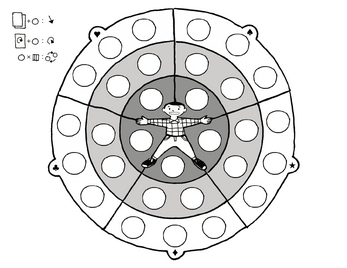 You cannot place a player token directly into one of the innermost rings. To connect you will need any two connector cards from the same suit (two hearts, two clubs, or two face cards for the star suit — ranks don’t matter) and one time particle. Discard the two cards, pay the time particle back to the stock of remaining particles, and place your player token in any one of the three circles matching the suit of connector cards you discarded. If you discarded two hearts you would place your player token on one of the three outermost heart spaces. If you have one of the five rotation cards (the four aces and one joker) you can discard it and use one time particle to rotate any one of the three rings one space to the right or left, moving all tokens in that ring one space over in the direction of your choice. You can rotate the outer ring, the middle ring, and the inner ring. This may move player tokens into or out of the different sections. This may be the reason why you'd want to use a rotation card! With the use of time particles you can move any placed player tokens one space on the board vertically, towards the centre of the board, away from the centre of the board, or horizontally around any the rings. If there is a player token in the space you want to move your player token into, the two tokens trade spaces. The cost to move a player token depends on the board ring a token is in. To move a token horizontally in the outermost ring costs one time particle. To move a token vertically into the middle ring, horizontally inside the middle ring, or out to the outermost ring, costs two time particles. To move into the innermost ring, inside the innermost ring, or back out to the middle ring, costs three time particles. You can use time particles to buy cards from the stock. A connector card (the 2-10s from the standard suits and the face cards that make up the star suit) are two time particles each. The rotation cards (the four aces and one joker) are 4 time particles each. After buying a card take a new card from the draw pile and put it into the stock in place of the purchased card. Take one of your player tokens not on the board and place it into the circle with a plus sign on the asset board. This is the time particle generator. Player tokens placed here will generate time particles that you can later collect. 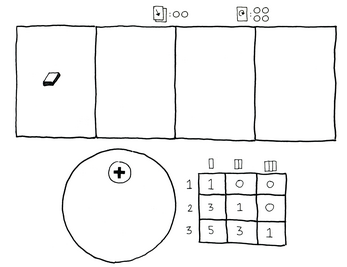 3 player tokens, per player, allowed in the time particle generator. So, in a two player game the maximum number of tokens allowed in the generator is 6 — 3 player tokens from two players. 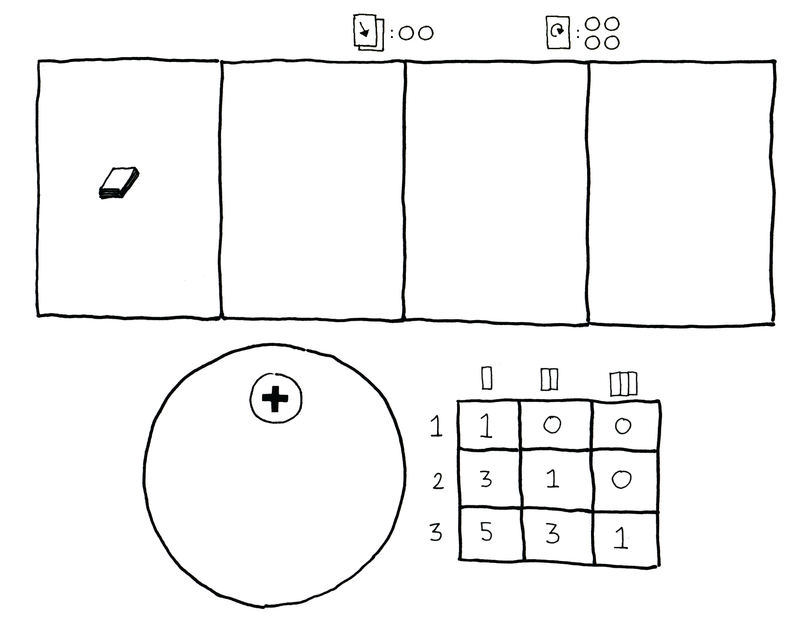 In a four player game the maximum number allowed would be 12 player tokens — 3 from each player. Take all player tokens that belong to you from the time particle generator and use the chart next to it to determine how many time particles you will receive in exchange. While you have tokens in the first ring of the board you will receive 1 time particle for 1 token, 3 time particles for 2 tokens, and 5 time particles for 3 tokens. If you only have player tokens in the innermost ring you will need 3 player tokens just to generate 1 time particle. As long as you have at least one player token in the outermost ring you can generate time particles using the ratios on the leftmost column of the chart. If the middle ring is the farthest out your player tokens are, use the middle column. If you only have placed player tokens on the innermost ring, you're stuck using the rightmost column.